King David is remembered for being a master of praise. 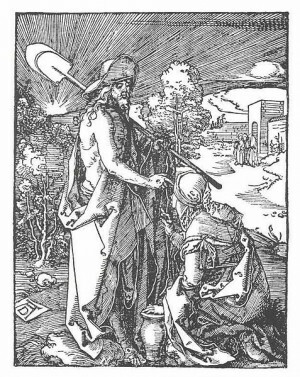 When you turn to the title page of our Book of Common Prayer, it lists the rites, sacraments and ceremonies of our common life in prayer as being there together “with The Psalter or Psalms of David.” This is the iconic portrait of King David: a psaltery, or a kind of lute or harp in his lap, mouth open in a song of praise to God, the precursor to that guy you knew in college who brought his guitar to every party and sat in the corner wailing away into the wee hours of the morning about some woman who was too good for him. Or perhaps the precursor to that guy you knew in college who sang a song so sweet you forgot for a moment that you’d gone a whole half hour without refilling your Solo cup. It cuts both ways. We see David soothing the madness of his precursor, King Saul, in this same way. He was so known for this talent for praise that the whole Book of Psalms, the whole Book of Hymns in the Bible intended to praise God, has been traditionally attributed to him. I think about this penchant of his when I hear the story of Bathsheba. First, a thought experiment. When I say “Bathsheba” what do you think of? You all just heard our David read the story. What comes to mind? If we take the majority of Western Art as a guide, we might see her as a very pale, very shapely woman, very naked in the middle of a bath with at least one arm stretched above and behind her [like this *demonstrate*] which I can tell you is not actually a very effective bathing position. This iconic image, of course, is only to be found in the eye of the beholder, it is David’s image, not Bathsheba’s. In the passage which we just read, we actually know nothing about Bathsheba other than what David thought of her, and saw of her, and heard of her, and made her do. Everything we learn about Bathsheba is through David’s perspective. She remains his object, an object of his lust, an object to be captured and consumed, and in her pregnancy, a problematic object to be resolved by willful deception and murder. So what is it about all this blatant objectification which makes me think of David’s legacy as a master of praise? Only that praise -which many of us enjoy doling out as much as we revel in the chance to bask in some of its glory- has a dark side. Lisa Bloom has written about this in a famous blogpost from 2011 called “How to Talk to Little Girls,” in which she meets a four-year-old girl named Maya at a party and resists the temptation to tell Maya how pretty she is, choosing to ask her instead what she’s been reading lately. It is our cultural custom to tell little girls how pretty they are. It is countercultural to regard and respect (as Alice Miller says) “the person she really is at any given time” in all her “emotions, sensations, and their expression from the first day onward.” The young child does not need to be praised for the things which are beneficial and pleasing to us, she needs to be seen and mirrored for who she really is.